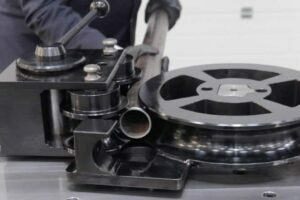 The humble tube bender – the machine that is, not the poor employee whose job in the past has been to try and complete such tasks with a hand bender. 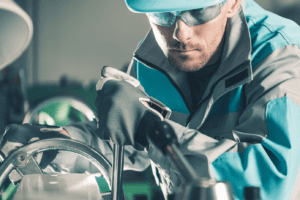 If ever a machine was devised to safely, quickly and accurately create curved metal tubes, by putting pressure on the pipe and bending it at a precise angle, then the Tube Bender is most definitely it. 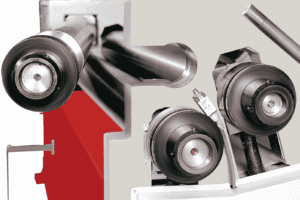 The fact is; if you or your business needs consistent and precisely bent tubes or pipes for whatever applications are needed, then the investment in a Rotary or Mandrel tube bender is easily worth the high levels of efficiency and accuracy you’ll gain. But, which one to choose, and what are the factors that could, or should influence your choice? Well there are a few to take into account, if you want to get it right then it’s worth looking a little closer at each type of bender in more detail. The first and most obvious thing you might notice about our range of Rotary Benders is that they are compact, and range from easy to use straightforward machines to precision programmable production models. Superb bend quality and a complete tooling service comes as standard however Rotary Tube Benders are best suited to working with thinner tube, with thicknesses of around 1.5-2mm. 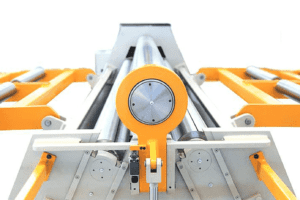 Note also that rotary models only support the tubing externally during the bending process, with a typical minimum centre line radius that is 3 x the tube’s diameter. Rotary tube benders also enjoy less wear over time due to much less friction between the tube and the counter former. Whilst not compact like their rotary counterparts, Mandrel Tube Benders offer more in terms of versatility and adaptability and importantly; support. With the support of a mandrel inside the pipe to form an accurate bend, your prized (and most likely very pricey) piece of tubing is supported not just on the outside but also from within. This makes the process of mandrel bending much more suited for things such as after-market exhausts, performance intake pipes and even roll cages. With less risk of deformation or ripple to the interior of the pipe during the bending process as opposed to Rotary benders, Mandrel tube bending represents a much better option when the interior of the pipe is as important as the exterior. For more information on our range of Rotary and Mandrel Benders, or for help and advice about which machine will be right for you, get in touch today.